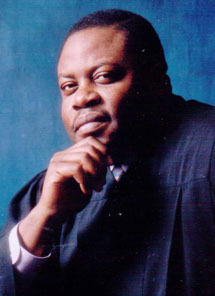 JUDGE MICHAEL EUGENE HANCOCK is a native of Gainesville Georgia. Born in 1949, in 1967 he became the first black to graduate from Gainesville High School. Two years later, he moved to Atlanta to attend Georgia State College where he ultimately earned a degree in Communications. After graduation from Georgia State, he took a position with the DeKalb Juvenile Court as an investigator for the Solicitor’s office. There he was encouraged by judges and court lawyers to consider attending law school. In the fall of 1975 he entered the Emory University School of Law and graduated in 1978. While at Emory he served as president of the Law Students Civil Rights Research Council and organized Emory’s first minority student recruitment conference. While in school he clerked for Margie Pitts Hames (a parallel case litigator to Roe v. Wade), for Fulton Juvenile Court Judge Romae Powell, and for the law firm of Arrington, Winter, and Goger. After law school, to pay it forward, he spent a year in the domestic counterpart of the Peace Corps as a Volunteer in Service to America (VISTA) where he was assigned to the Atlanta Legal Aid Society’s Senior Citizens Law Project. From there he went to work for Georgia Legal Services in his hometown, but shortly thereafter came to the realization of the truth of Thomas Wolfe’s words: “You can’t go home again.” He returned to Atlanta where he joined the Fulton County Public Defender’s Office. But since his days at law school, DeKalb County had always been where he wanted to make his legal mark. Called “the Dean” by some, beginning in 1981 Judge Hancock started to blaze a number of trails in the DeKalb County legal system. He was a pioneer as the county’s first African-American assistant public defender and then assistant solicitor general. He became the county’s first full-time black judge when he was appointed chief judge of the DeKalb Recorders Court in 1983, where he served until April of 1991. DeKalb legal history was again made when then Governor Zell Miller appointed him to the DeKalb Superior Court bench, a position he held until his retirement in January of 2012. He was founder and the first president of the DeKalb Lawyers Association. In his retirement, he continues to hear cases, but also spends time vegetable gardening and playing guitar and golf. Given his long-standing interest in the intersection of law and faith, in May of 2016 he obtained a Master of Arts in Christian Studies from Luther Rice College and Seminary and plans to do research and writing in that area.